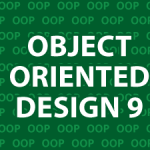 Welcome to part 9 of my Object Oriented Design tutorial! This all started back in part 3 in my UML Use Case Tutorial. Here I’ll finish turning sequence diagrams into code. If you get good at this process you’ll be able to make any program no matter how complicated it may be. All of the code from this and the last tutorial can be found below to help you learn. In the tutorials that follow I’ll answer all of the design pattern tutorials I’ve been receiving. Hi Derek, trying to watch part 9 of this tutorial, and the video seems to be broken somehow, on youtube it stops after only a minute, then on your site it stops after about 2 minutes. Just a heads up, and I would love to continue watching this tutorial. Hi Derek. As you said, this is important topic. I dont want to move on Android tutorials before watching OOD tuts. I can understand how this ATM works, but how did you decide when and where to make Transaction object? You made it when isStripReadable is called. Thank you Derek, you are great.